It’s been a miserable couple of months, so damn busy I couldn’t find time to write but finally, I am able to sit down and tell you about a new beer I found, called Misery Bay IPA. I thought the label was perfect for the way I was feeling and the fact the Jets were up against the Patriots today. 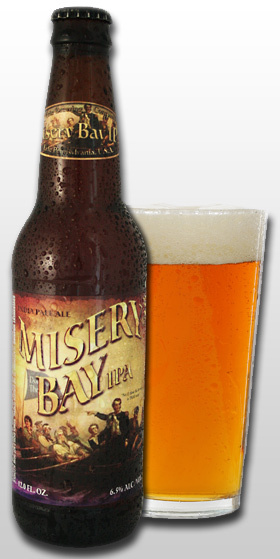 Misery Bay IPA is from Erie Brewing located in Erie, Pennsylvania. I never heard of them, so I had to look them up. According to their website they started out as a Brew Pub in 1994. By 1999 they became a full-fledged microbrewery. In less than 10 years (2007) a major venture capital firm helps them and their distribution reaches 7 states. In 2010 they can be found in 14 states and I think they will continue to grow. This Misery Bay IPA is named after all the hardships endured during the battle of Lake Erie in the war of 1812. Misery Bay IPA is a tribute to the soldiers and sailors who lost their lives at Misery Bay in Lake Erie. Now this beer has taken on a whole new meaning. I thought I was in a slump before, now I am hoping I like this beer… a lot. Here goes. Wow! It pours a rich amber, almost dark copper color and the head is full and leaves a nice lacing on the glass. The smell is hoppy, pine, a little cameral and a sense of honey…? I am not miserable anymore! Lets drink. Oh my! Hops right off the top followed by some citrus taste and ends with slight malty sweet flavor. I think the sweetness at the end is throwing me off. Misery Bay IPA is not like other IPA’s I have had in the past. The strong hops (bitterness) up front and this sweetness at the end make for an interesting complex delight. I have 5 more to go and at 6.5% ABV, I am not sure I’ll make it. Though Miser Bay IPA isn’t an award winner, Erie Brewing does have a couple of distinguished medals. Their Railbender Ale and their Derailed Black Cherry Ale have both won awards from Great American Beer Festival in Colorado, which is no small feat. This is a beer worth trying. I know I say that about all my beers but when I find the one that isn’t I will definitely let you know. Funny thing, is I was having some super sharp cheddar cheese which I cut up for some guest, who never showed 🙁 , it seemed like a good pairing. Erie’s website does call for a more spicy cheese but it was good. Misery Bay IPA got me out of my slump and a Jets win put a smile on my face.